The Voigtländer Bessa III (€ 2,000 / $ 2,700) is a traditionally styled medium format camera with folding bellows lens. It shoots 6x6 (nominally 56mm x 56mm) or 6x7 (56mm x 70mm) images that squeeze every last grain of detail from a roll of 120 or 220 film. Of course, you'll only get a dozen or so hand-wound shots before having to change the roll. The Bessa III is equipped with a manually focused six element f/3.5/80mm lens. Mercifully, the shutter is electronically controlled with speeds ranging from 4 to 1/500 seconds. The device also offers electronic center weighted average metering with exposure compensation. In short, it's a curious mix of vintage and modern design. Available May 2009. Follow the jump for detailed specs. Skelly Gas issued an imaginative series of All American Space Fleet collector's cards in the 1950s. It appears that space exploration was exclusively a male pursuit in those days -- ships were crewed by countless rugged spacemen, crewmen, ore men and radar-men. The Hollywood Wax Museum is auctioning off a collection of life-sized wax figures. That's right, for $3,000 you could be the proud owner of Mel Gibson as William Wallace from Braveheart, though the figure looks more like a bedraggled street person than the ill-fated Scotsman. Other highlights include John Travolta & Uma Thurman in Pulp Fiction, Sir Alec Guinness as Obi-Wan Kenobi, William Shatner and Leonard Nimoy from Star Trek, and Michael Keaton as Beetlejuice and Batman (I guess his star is waning). I'm prepping my credit card to create a brilliant Halloween diorama featuring an ominously creepy Alien replica dismembering hanging out with Nicole Kidman and Dorothy from The Wizard of Oz. This is a low-priced phone from about 1999. It's a simple little Sony that still works and sounds great. The phone came in a lot of chic colors with a sprinkling of style, all for $20. I just found this comic book inspired version at a thrift for a buck, which is even more stylish than the one I already have at home. Great for a retro house, but here's what's weird. I could find no record of it on the internet. Something that came out in 1999 isn't on the net? There's barely a record of the regular models of the IT-B3 phone online, let alone this specialty pop art number. Not that it's super important to have the internet act as a catalog of every piece of plastic drek that's ever been, but it does bring a point to mind. I meet a lot of people these days who rely on the internet instead of simply remembering things on their own. Know someone like that? How many people have told you that their palmtop has replaced their brain, even for remembering the simplest things? I even have a friend who doesn't know her own phone number - she has to call my phone so we can both figure it out from the caller ID. I guess that I'm a Luddite for harboring a fear of over-reliance on technology, but what am I supposed to think when my friends can't remember something easy like calculating a tip? The internet isn't a perfect snapshot of facts or recent history. "Old media" like newspapers and TV aren't perfect either, but in my circle it seems like folks honor a Google search as if it were a message from the Oracle at Delphi. The hazardous bit that people seem to forget is that the Oracle would often answer truthfully without giving a true answer. I guess that's why we're here. At Retro Thing we help the internet remember those forgotten bits of crucial information, old & not so old. We even help people remember fun things like (deep breath, now...) 10 year old comic book inspired phones that still work well and sound plenty good for $20. Dave Clausen from the NYC Resistor hacker collective just gave us a shout about a stunning retro arcade museum in Beacon, NY, a 75 minute train ride north of Grand Central. Their display collection includes a number of obscure titles such as Atari's Steeplechase, electromechanical pinball machines and a half dozen Chicago Coin shooting games - the sort of stuff you don't see much these days. And - if you have the time - the arcade machines on display are in playable condition at a mere $10 an hour. I'm particularly mesmerized by a display case filled with row upon row of handhelds from the likes of Bandai, Coleco, Entex, Epoch, Mattel, and Tandy. It's like the Sears Christmas Wish Book without the boring Barbie section. Hyperkin has been churning out inexpensive NES clones for years, but it seems like they're running out of new ways to repackage the same tired old concept. The FC Mobile II is a compact handheld console with 2.5" LCD screen and composite video out. It ships with two wireless controllers and a wireless light gun, allowing it to function as a TV-based retroconsole as well as a portable. The machine itself is cute as a button. However, it loses it's appeal the moment you slap a gigantic vintage NES cartridge into its back end. The weight and balance of this thing is utterly atrocious; the ergonomic equivalent of gluing a paperback novel to the top of a Game Boy Micro. A second issue is the light gun. We haven't had a chance to put it through its paces, but I'm almost certain it won't work with LCD or plasma screens. The original relied on scan line timing on a CRT, and I suspect this model is exactly the same. So expect to break out the fuzzy old 13" RCA TV from your youth if you're craving a drunken round of duck hunt. This might well be FC Mobile's last dip into the NES goldmine. Nintendo emulation has been done to death for the past decade, and no amount of wireless tomfoolery is going to reinvigorate the market. The FC Mobile II can be yours for $59.99 sometime in May, 2009. Available in washing machine white or paper shredder black. "At the beginning of 2001, SEGA admitted defeat. After 18 years in the console business and only a few short years of real financial success, they were finally calling it quits. The Dreamcast ceased production in March of 2001, and the final units were cut to $50 before disappearing from stores. The announcement echoed Stolar's decision to leave the Saturn, but lacked the silver lining. As with the Saturn, SEGA and a handful of third parties put on a brave face, and games continued to ship in the US into the first half of 2002. By that time the GameCube and Xbox had made their way onto shelves, and the Dreamcast's last hope was gone." SEGA occupies an unusual spot in the gaming world. American founder David Rosen stayed with the company until 1996, and the frequent use of American talent created a company that straddled the Pacific ocean. While the brand still exists as a software division of Japanese gaming corporation Sammy, hit titles are fewer and further between. I joked about this tendency to try to broaden brand influence when I was interviewed by The Brand Show a while back. I joked that brand names are being slung around and remixed so much, that it won't be long before we have Tidy Cat toothpaste. Let's hope that some slick consultant doesn't one day fly an idea that rotten, but someone really shellacked Mobil Chemical when convincing them to manufacture disposable wine glasses. So what fine brand is on this box of thrifty plastic vessels for an evening's sophisticated sipping? Hefty. TV commercials used to chant the toughness of their famous plastic garbage bags - "Hefty, Hefty, Hefty". Probably not the quality paramount in wine glass selection. Sure, we live in a disposable culture, but is it too much to ask that we celebrate the vino that we serve our guests with a bit more panache? Then again, having a few plastic flutes on hand when ham-fisted drinkers show up with some Two Buck Chuck might keep Grandma's crystal safe for another generation. Fortunately the box does recommend reusing the glasses, so that's at least one mark in their favor. Still I can't shake the Hefty name, even if they print in mauve to look classier. I feel like these glasses are tailor-made for me to have some elegant refreshment next time I take my trash down to the curb. Sorry marketing consultants. Next time I'm having a snort of White Zin out of my plasti-glass, all I'll be thinking about is that the eventual destiny of my "crystal" will be... wait for it... a Hefty bag. Makes ya think, don't it? ThinkGeek just took delivery of a shipment of ten year old Dreamcast consoles, brand new in the box for $99.99. They report, "These arrived mysteriously at our warehouse... delivered by a blue hedgehog. So dig up that old copy of Soul Caliber and get cracking. Each Dreamcast console is new in the box and comes complete with a single controller, av cable and demo disc. You of course get a built in 56K modem and phone cable... which we assume you'll make great use of :) You'll need to provide your own games... but we know you can handle that." Um, yeah. What they're trying to say is that the Dreamcast is well known for its crackability. The Dreamcast library numbers some 350 titles, although about 100 of those were Japan-only. The light bulb has been with us for some 130 years. There have been changes and tweaks along the way, but for the most part the basic design has remained more or less the same. Whether you're lighting up a room, or cooking a brownie in an Easy Bake Oven, it's no exaggeration to say that the low cost and relative efficiency of the light bulb has shaped our modern world in myriad ways. There is a relatively recent spotlight on one of the costs of the light bulb, the cost to our environment. The last few years have seen a flurry of development in new sources of illumination. Multi LED arrays and Compact Fluorescent Lights provide the same amount of light at much lower wattages. There is a distinct push toward worldwide adoption of these new light sources. More and more countries have laws on the books that will eventually outlaw (yes, they're really using the word "outlaw") certain wattages of conventional light bulbs in a global effort to reduce pollution. In the past, local power companies offered a sort of "light bulb club". Subscribers paid for bulbs as part of their electric bill, and were entitled to pick up an allotment of bulbs at local shops. The idea was to save consumers money while encouraging them to use lower wattage bulbs (some were odd wattages I'd never seen before. A 41 watt bulb?). Or you could be like my boss at my high school job who squeezed the maximum number of light bulbs possible out of the service. The large number of light bulbs pictured came from just such a hoarder, but let's get back to talking about today. From my casual observation, consumers are accepting of these new bright spots in their lives. The high initial cost is quickly offset by a real savings on the monthly electric bill. The only down sides I see are the clinical bluish cast of such lights. I prefer the warm tones of an incandescent, especially for photography. Also there is a small quantity of mercury in CFL lights. Not enough to be harmful if one breaks, but worth keeping out of the ground. Fortunately many retailers are taking CFL bulbs back for safe disposal and to recycle the electronics within the fixture. As time goes on, more advanced versions of these alternative light sources will hopefully be a bit more sympathetic to the eye. The outlawing of incandescents in the future excludes low wattage and decorative bulbs, so you'll still be able to enjoy dimmable romantic mood lighting when the spirit strikes. There's no need to run out and replace your Christmas tree strings and night lights. The laws are intended to move the bulk of day-to-day illumination to more environmentally responsible alternatives. It's a marvel that a modern incandescent bulb still has a lot in common with those of Edison (and the many forgotten inventors and patent holders that got there before him, but that's another story). As we move on to new sources of light, I hope that no matter what moebius strip shaped device we screw into a light socket, we'll still call it a "bulb" as a bit of a tribute. Why not? After all we still "dial" a phone on a keypad - and we don't call its ring an "electronic chirp". As we move toward more environmentally responsible light sources, let's not forget to admire the simplicity of the cheap and reliable incandescent bulbs that made so much more possible for our entire planet for so long. Charles Altmann is a German DIY fanatic. His creations include a diesel motorcycle, natural sound hi-fi speakers and the Altmann DIY turntable. He says, "After the success I had with my homebrew tonearm, I decided to build a turntable that is able to fathom the sonic delicacies that the tonearm is able to produce. Those who visit my sites regularly already know that I am a sucker for natural tone. Therefore the turntable is made to large parts out of wood. 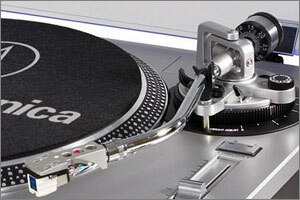 Wooden base, wooden motor base, wooden turntable-platter, wooden tonearm. Some ideas make this turntable easy and cheap to build. Depending on your local price for wood, and your ability to find some surplus parts, total cost can be as low as $50. The turntable consists of two separate massive plywood-blocks (glued together from boards). One supports the platter and tonearm (main base), the second supports the motor (motor base). The platter is driven by a simple thread out of mom's sewing box. This way the motor is decoupled from the main base. Between the main base and the motor base, there's a gap. By moving the motor base away from the main base, you can adjust thread tension." Visit his site for pictures and a description of how a handful of Harley Davidson components ended up serving as a turntable platter bearing, along with details of his other ambitious projects. How better to celebrate the austere and ancient contest of the minds that is chess than to release a version ready to go down to the disco? Calling it "disco" isn't accurate at all as this set was born in 1971 - same as me. Given the year, it's more psychedelia than Saturday Night Fever. Kidding aside, chess is a great game. A game of kings, yet one accessible to anyone. Cheap plastic pieces put a chess set within any future Bobby Fischer's reach. Many masters started with just such a set - it's common practice to fill the hollow pieces of a cheap set to aid play. Yet this "World Of Family Fun" uses the clear plastic pieces as an appealing aesthetic asset. By molding the pieces in transparent funky day-glo colors (they call it "Crystalite"), you get a spacey set of chessmen that were probably still rather affordable. We've said before that sometimes the most interesting time to inject style into an object is when it doesn't really need any. Do the new funky colors make this game more appealing to youth? I doubt it, but it really doesn't matter. Maybe this was some 70's kid's first chess set, and maybe this was the beginning of a lifelong love of the game. It's a great testimony to the centuries-old game of chess that it doesn't suffer at all through innumerable plastic permutations. It always makes me smile when someone uses retro computer hardware to create music today. Normally this is in the form of a Game Boy chiptune, or perhaps squeezing more than two notes of music out of an Atari 2600. It's seldom the actual hardware making the musical sounds happen. Thanks to the untiring efforts of YouTube author bd594, he has harnessed the motor sounds of a scanner, floppy drive innards, and old Atari & TI computers to creak and buzz out a very credible version of "Bohemian Rhapsody" by Queen. These aren't manipulated and sampled sounds (though the author does mention doing some multitracking to thicken the chords), the song comes from the noises of the actual hardware. I find the sound oddly reminiscent of an automatic fairground organ, or some Victorian era mechanical music machine. The way that the gear mildly drifts in and out of tune, the fragile nature of the sync, even the actual timbres of the music itself sounds much more ancient and charming than a pile of 80's scrap computers should. It's all terribly clever, and infectiously smile-inducing. And yes, there's a devil put aside for you too. This simple $29.95 pocket watch is an interesting juxtaposition of vintage and modern design. It features a Japanese analog quartz movement that never needs winding, along with a 14" chain and belt clip. The case diameter is 41.5mm (1-5/8 inches) with a depth of less than 10mm (3/8 inch). Perfect for days when you choose to leave your phone at home but still need to know the time.